It’s almost Halloween so make this Wicked Wednesday the best (or worst) one yet by banishing evil spirits, cavorting with ghosts, and damning your enemies. Woo hoo! 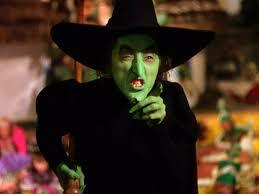 It’s the Witching Hour!!! This floor wash is used to drive away negative energy, banish evil spirits, and eliminate anger directed at you. It also creates a barrier of protection. Start by scrubbing the back of the house, making your way out to the front step to drive away evil spirits, anger or general negative energy. It is best to start before dawn. Throw the remaining water to the east at or before sunrise. To make spiritual water specifically for communing with the dead, go to a cemetery at midnight and bring a bottle of spring water. Place the bottle of water on the grave of a person who represents the deceased you wish to speak with. For example, if it is a child, place the bottle on a child’s grave. If you are seeking assistance from the dead for a particular purpose, such as protection, then place the bottle on the grave of a known police officer. Allow the water to stay on the grave until just before dawn. When you remove the bottle, be sure to pay the spirit with a small bottle of rum and three pennies before you leave. The purpose of this spell is to undo your enemies and tae the power to harm you away from them. Take two drachmas of the damnation powders and two drachmas of the water powders. Make a package of them and send it to the home of the one who has spoken badly of you or treated you poorly. This will cause damnation and trouble for the enemy. This entry was tagged Denise Alvarado, ghost water, Halloween, hexes, spells to damn your enemies, Voodoo Hoodoo Spellbook, wicked wednesday. Bookmark the permalink.